A collection of three artistic games from a famed creator is coming to DSiWare this year. Roger Ebert might not think videogames can be art, but Nintendo DSi owners will be better equipped to dispute his claim sometime this year. Joystiq caught a press release from Sabarasa that announces the future release of a compilation from well-known videogame art developer Jason Rohrer. If you've ever looked at a top-ten list of games that could be considered art, chances are you've encountered a Jason Rohrer creation. His most recent release was Sleep is Death, which is like a two-player version of Dungeons & Dragons, but without the dungeons and the dragons. The games included in Sabarasa's release, called the Alt-Play: Jason Rohrer Anthology, will be three of his past works: Passage, Gravitation, and Between. The collection will be released as a DSiWare download and likely priced cheaply considering all three games can be played for free. However, they cannot be played for free on a Nintendo DSi XL's giant screens, which would no doubt increase the factor of enjoyment. Passage is about life, what people choose to spend it doing, and how it doesn't quite last forever. Rohrer says Gravitation is about "mania, melancholia, and the creative process" but I thought it was about kids, blocks, and a ball when I played it. Between is for two players and about "consciousness and isolation." Art is usually very much up to interpretation, so play them for yourself. 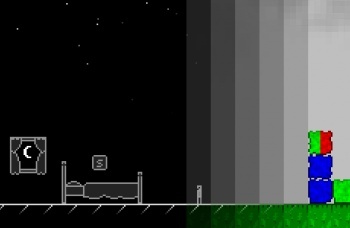 Rohrer's puzzle game designed for the iPhone, Primrose, is also coming to DsiWare from Sabarasa. Do you really want to stick it to Roger Ebert and force him to change his mind on games as art? Do you not care about a movie critic's opinion and just want to play some neat games that might make you think a little? Check out Rohrer's games, or wait for the DsiWare release of Alt-Play: Jason Rohrer Anthology, though it doesn't have a confirmed price or release date yet.